Lime Green is a Philosophy. Lime Green is a philosophy of increasing the efficiency and performance of a building. You do not necessarily need to certify your building to be "Green". Increased performance leads to lower operating costs, healthier environments, and occupant well being. Sure, we believe in Certifications, but that's typically more for marketing than performance. And if that is within your budget or goals, we'll be happy to help you. 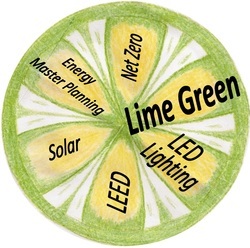 However, we encounter far more clients that want, or need, to "Lime Green" a facility through sustainable or "Green" practices in order to lower the operating costs of that facility. Years ago, while constructing a speculative office building in Gainesville, FL, we were running into obstacles that prevented a cost effective justification for LEED Certification of the shell of the building. The developer did not want to infuse more capital into the facility without having the ability to receive a return on that initial investment, especially in a declining market. LEED Certification brings a higher marketability to developmental property, but the price tag of doing so is likely to prevent a tenant from signing the lease. As we struggled with the decision, it became apparent to me of what REALLY is "green" without a USGBC plaque? A plaque does not make a project green or sustainable. The technologies and "best practices" are what make a project sustainable! But what if your budget cannot take on the entire USGBC checklist, does that mean that being green is an all-or-nothing venture...it does for most. But, what if your budget and capabilities were just shy of the label? What is just less than "green"...it is Lime Green! Many professionals have used the terms of sustainable practices, or noted a building as being environmentally conscious, or even just Green-Washing by calling a building "green" if it really just has exotic finishes. By creating a label to the generic term for designing and constructing buildings that lower operational costs. For most building owners, tenants, or homeowners, to lower the operational costs means that there is more profit at the end of the month. Or it means that a family can rest peacefully knowing that they are now responsible with their utility usage. Through the Benchmark process, a facility can specifically target areas that receive the largest "Bang for the Buck" within the allotted budget. By Benchmarking specific items that immediately reduce the utility usage, we work with our clients to always stay within their budget and not suggest technologies that exceed their means. There are truly low cost technologies that bring immediate effects and provide a return on the investment in less than 12 months!